Hi there! Welcome to Day 6 of Teasers for the My Favorite Things December release! Today is probably my favorite teaser day as it is Pure Innocence Day! Seven new Pure Innocence cuties will be released tomorrow! 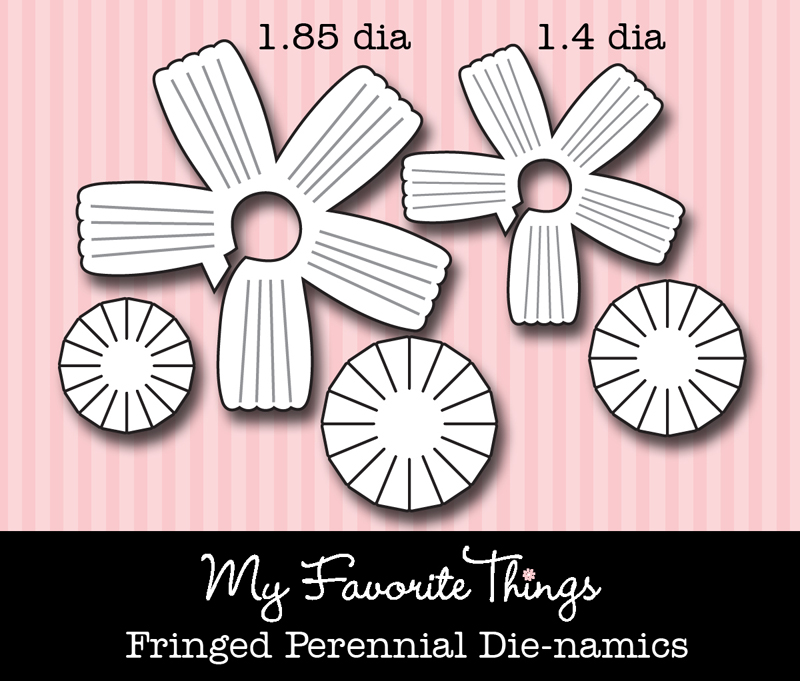 In the detail shot above, you'll notice that I layered 2 of the fringe centers from the Die-namics Fringed Perennial Die in the center of my bow. I wanted to add a flower, but I didn't want a large one, so I just used the fringed circles to create a little bloom. I colored a pearl with a Copic marker and added it to the center. I finished the inside of my card very simply by using some scraps from my card front. I added a strip of the Crown Border again and my sentiment is from the mini set included with the VIP Winter Cuties Collection. 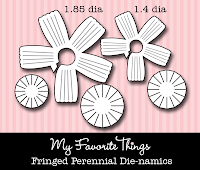 Accessories: Die-namics Fringed Perennial Die, Die-namics Oval Open Scallop Doily Die, Die-namics Crown Border Die, Die-namics Dog Tag Die (My Favorite Things); Oval Nestabilities (Spellbinders), Corner Chomper (WRMK), Markers (Copic), Seam binding, Twine (May Arts), Pearl, Foam tape, Thread, Sewing machine. Accessories: Die-namics Open Scallop Doily Duo, Die-namics Little Open Scallop Strip, Die-namics Loopy Bloom (My Favorite Things); Standard Circle Nestabilities (Spellbinders), Markers (Copic), Glitter, Felt, Frosted Pearls (Pizzazz Aplenty), Orange Divine Twine, Boosters, Red line tape, Thread, Sewing machine. What an awesome card and bookmark!!! such a sweet card! love the flower/ribbon embellie! and that bookmark would make any girl want to read! love all that glitter! Sweet card, adore the bookmark, what a great idea. Sweet card and bookmark! Love the ribbon and little flower combo with the tag. Awesome creations, love the idea of the book mark so cute! 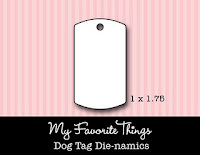 Love your card and tag...they are both beautiful!! soooo cute and pretty! 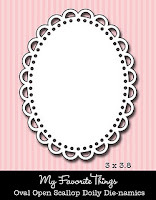 love the card....the fringed center on your bow is a great detail. love the bookmark....forgot about those! great work. ahh..your ice princess is just delightful! BEAUTIFUL!!! Love her outfit on the bookmark! The bookmark is a great idea! I forget to make those!! These are BEAUTIFUL Steph! 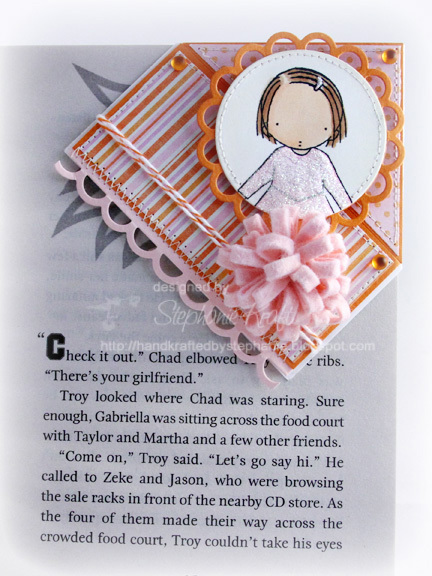 LOVE the layout, stitching and border on your card, and her SUPER sparkly outfit on your bookmark! Both creations are just UNBELIEVABLY gorgeous Stephanie!!! these are beautiful! 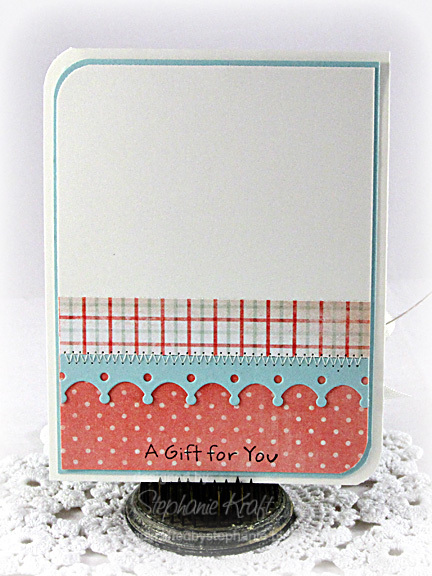 love the layout in your card, she is a sweetie. the bookmark is so sweet, I really need to try one. Very sweet. 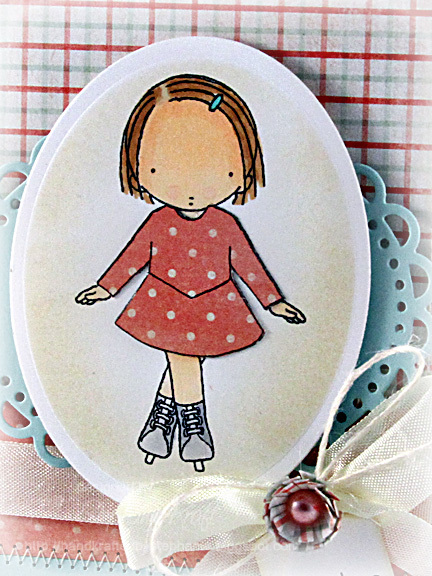 Love the skater's sparkly dress and the loopy flower. very pretty card and bookmark! These are adorable! Love all the sparkle on the bookmark! 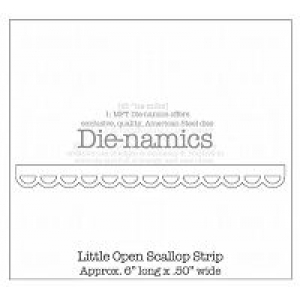 All the detail in a little bookmark. So pretty! Gorgeous creations, Stephanie!! Love the PI beauties on the card and bookmark. Great job!! oh so cute!!! Both the card and the bookmark!!!! Adorable!!! love that fuzzy pink outfit on the bookmark! 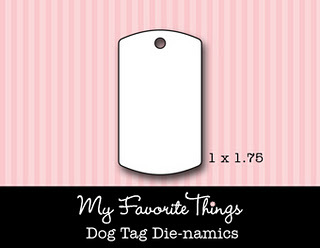 Love the little bookmark tag! Super cute! Love it! i love her glittery dress! Love the colors in your pretty first card!!! 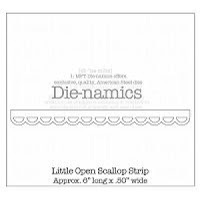 :) I've never heard of a corner bookmark, but I like it! (Can the book close with that gorgeous felt flower?! ;) Her pink flocked dress is to die for, too! Stephanie, your card is darling!!! And I love the bookmark! I bet Sabrina loved it, especially with that gorgeous flower! Both absolutely adorable projects! I love the bookmark idea!